Mix oatflakes with 2 tablespoons of the honey and spread over a sheet of greaseproof paper on a baking sheet. Cook in the preheated oven for approx. 15 minutes, stirring at regular intervals. Remove from the oven, mix in the ginger, if used, and leave to one side to cool. Clean and chop the berries. Mix the yoghurt and cr̬me fraiche with the grated lemon rind until well combined and sweeten to taste with the remaining honey. 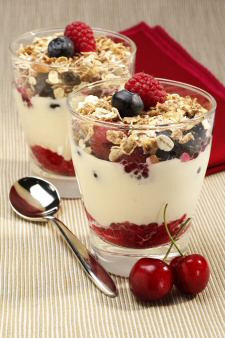 Layer the berries, oats and the yoghurt mixture alternately in a serving bowl or individual serving dessert glasses. Refrigerate for 1 -2 hours before serving.